Again, the history of our founding Scientific Learning Corporation, Posit Science Corporation and the Brain Plasticity Institute have been told elsewhere, albeit in abbreviated form. See History of Neuroscience in Autobiography, Volume 7, Chapter 10 (2012). Paula Tallal has written many reviews summarizing her perspective about the origins of language learning and reading impairments in child populations. Reviews from that era: Tallal P et al (1993) Neurological basis of speech: a case for the preeminence of temporal processing. Ann NY Acad Sci 682:27. You might note that Tallal emphasized the “temporal processing deficits” that distinguished the impaired child. In fact, children who struggle with language and reading also have spectral (and other) processing problems. Our training was designed to address these other dimensions of impairment as well. As related in this Chapter, our presentation in the same meeting presented our own perspective at that time about the probable neurological bases of the problems that limited the language and reading success of these children. See Merzenich MM et al (1993) Neural mechanisms underlying temporal integration, segmentation, and input sequence representation: Some implications for the origin of learning disabilities. Ann NY Acad Sci 682:1. The Dana Foundation had supported our initial training study, and when we obtained the exciting positive results in the outcomes trials described earlier, we thought that they would be thrilled to hear about our progress. We therefore called the Foundation and invited ourselves to come to New York to talk with them about it. 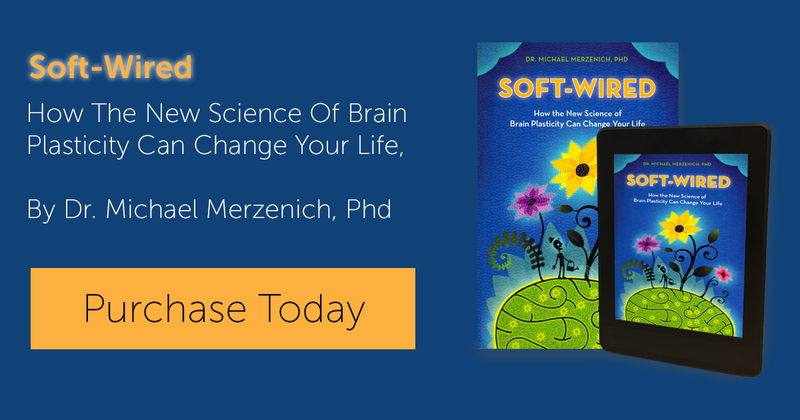 Our goal was to enlist their further support in ‘getting the word out’ to the millions of children who could benefit from this brain plasticity-based training. The Foundation had been established to translate brain science out into the world to deliver help. We thought they would be an earnest and enthusiastic source of future help.In fact, we arrived to discover that their Chairman, David Mahoney, was absolutely infuriated by what we had done. He interpreted our steps taken to establish a company that, with private investment, would further develop and market brain training programs to help impaired children, to be an inexcusable rip-off of the Foundation. Almost before we could get our story out, he was red as a beet, repeatedly pounding his fist on the conference room table, telling us what low-lifes we were, loudly exhorting that the Foundation “deserves a million shares in your company for a penny a share,” letting us know in no uncertain terms that we were disgraceful varlets. I’ll never forget Paula Tallal breaking out in uncontrolled sobs in the lobby of the New York City headquarters of the Foundation after we left their offices, pretty much completely disheartened and shamed by Mr. Mahoney’s relentless bullying. When we informed our University presidents of this unexpected response to our attempt to be nice to—and get further help from—the Foundation (they also heard from Mr. Mahoney), they created a Blue Ribbon Committee that was acceptable to the Foundation to determine whether or not we had done anything wrong, and whether anything should be done about it. The committee of outside big shots concluded that everything had been done according to the rules by which Foundations interacted with Universities (we had, after all, taken every step down this practical path with the explicit guidance and help of our Universities)—but noted that while we were not required to, out of politeness we should have done a better job of keeping the Foundation informed about what we were up to. After the Committee informed Mr. Mahoney that he was in the wrong, he adamantly requested that we award stock gifts directly to the four universities that had participated in this consortium grant—even while two of them had nothing whatever to do with the project. While there was no requirement that we do so, we immediately agreed to this request, not because it was right or necessary, but because, at that point, in sharp contradiction to David Mahoney, stock or money were the LAST things on our minds. In this rather remarkable way, the Dana Foundation managed to convert a great victory into a something that they never quite gotten full credit for. I give it to them now. They contributed at a crucial time to getting the brain plasticity revolution off the ground! The two papers published in the journal Science: Merzenich MM et al (1996) Temporal processing deficits of language-learning impaired children ameliorated by training. Science 271:71; Tallal P et al (1996) Acoustically modified speech improves language comprehension in language-learning impaired children. Science 271:81-4.